I am still trying to catch my breath from BlogsPaws, but let me tell you, it was FURtastic! 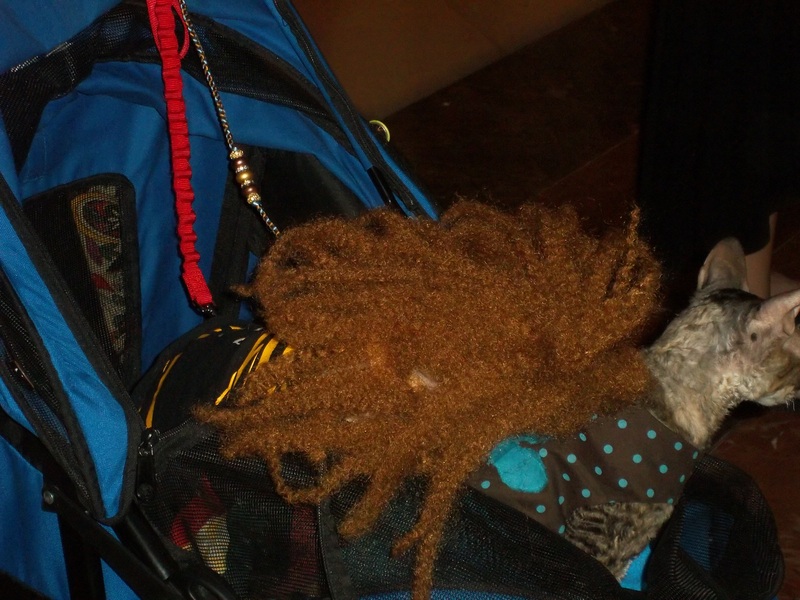 There were lots of people, dogs, cats, birds and even some ferrets. It really was a mixed bag and speaking of mixed bags, you should see the swag that we brought home! 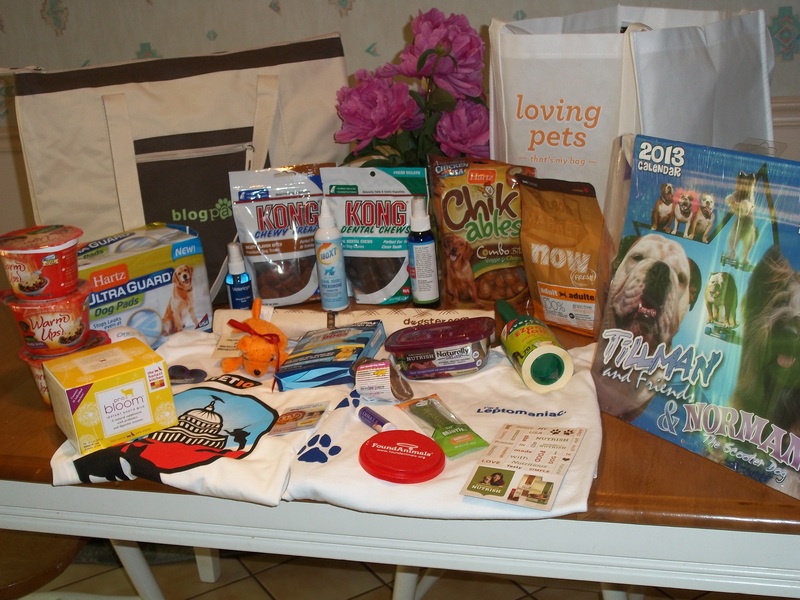 There were treats, totes, tees and tips that will come in handy for dogs and humans alike. The peonies in the picture came from Carlin’s garden — I have the greatest neighbors! Norman the Scooter Dog from Who Let the Dogs Out? was the biggest celebrity that I saw. I heard there was a local weather dog, but I didn’t get close enough to get a picture. 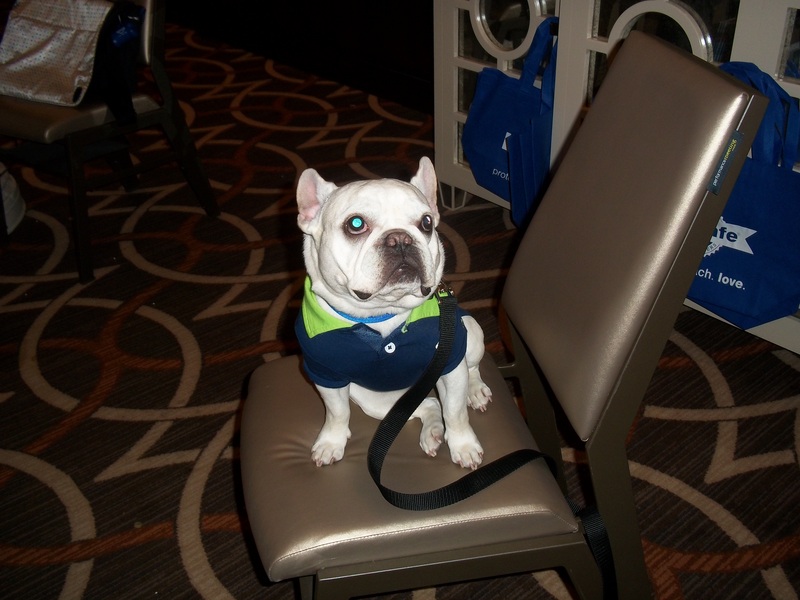 Her fame may not be as great as Norman’s (yet) but Buckley, the French Bulldog charmed everyone who went to the PetSafe booth. She belongs to Robin and Buckley wore a dress matching the bridesmaids’ dresses along with a tiny pillbox hat made by the mother of the bride at Robin’s wedding. I promise, I saw the picture and it was adorable! Rocco the Havanese was another dog whose name I remembered. We attended a couple of the same sessions and he was most forgiving when I accidentally nearly stepped on him. I also met Pixel Blue Eyes (I swear her eyes are really brown) and her mom, Jenny Lewis. On Friday night, I had a lot of fun with them and Jobi Harris who writes the Ask Fisher blog where she talks about her cats and does pet product reviews. We hung out in the bar as guests of Found Animals, a microchip registry. It’s really lame on my part that I don’t remember her name, she was fun and quite generous. I didn’t catch the names of all the pets, there were quite a few and all were well-behaved with no knock-down, drag-out brawls. There was a Zoe there and I heard a man mention he had a Dudley at home and that plucked a little twang on the heartstrings. 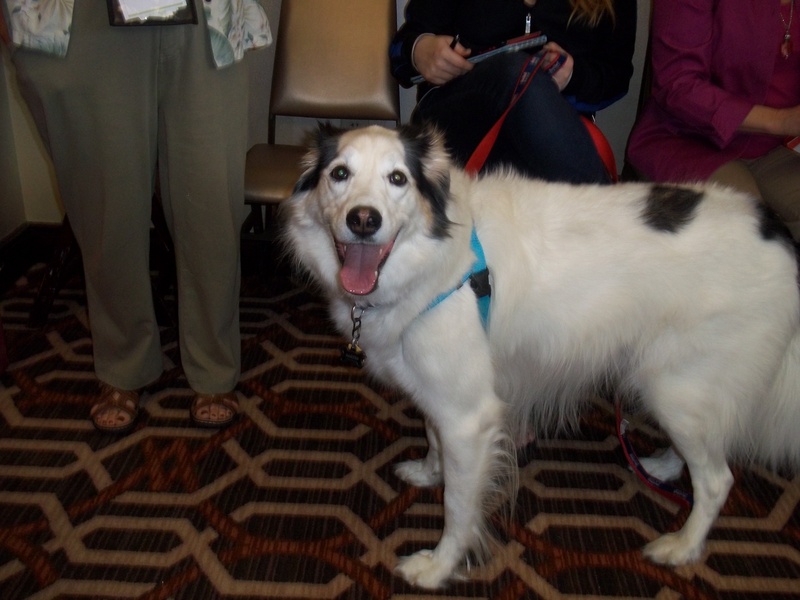 I learned a great deal at BlogPaws, there were wonderful speakers whose messages I will share with you in the near future. 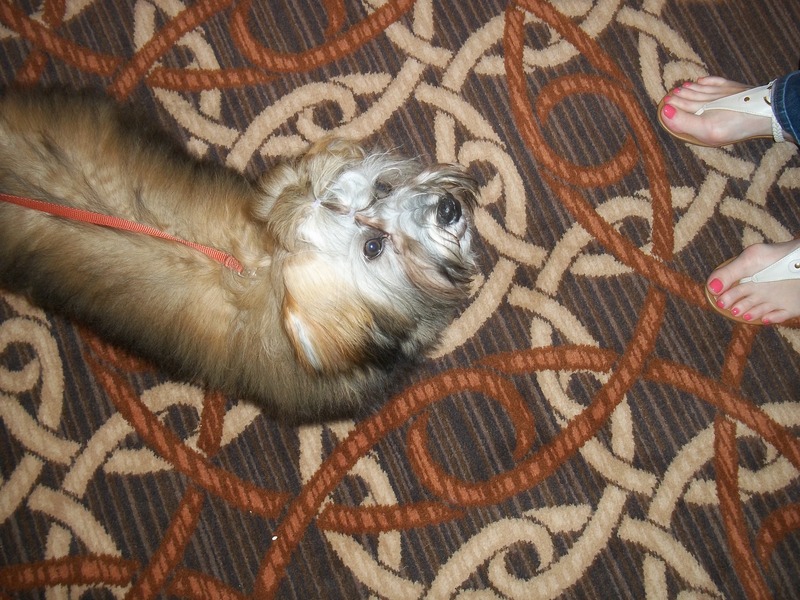 In the meantime, I leave you with some pictures of the best part of BlogPaws! 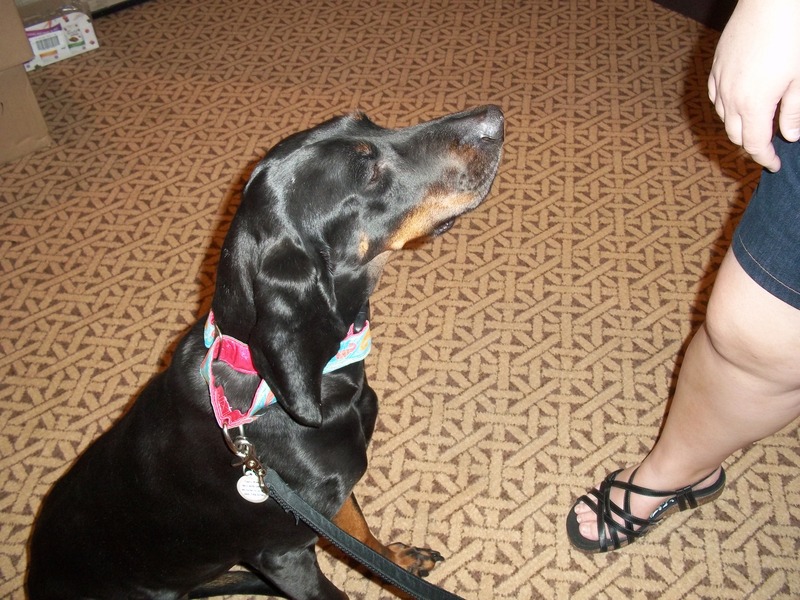 A beautiful black & tan! 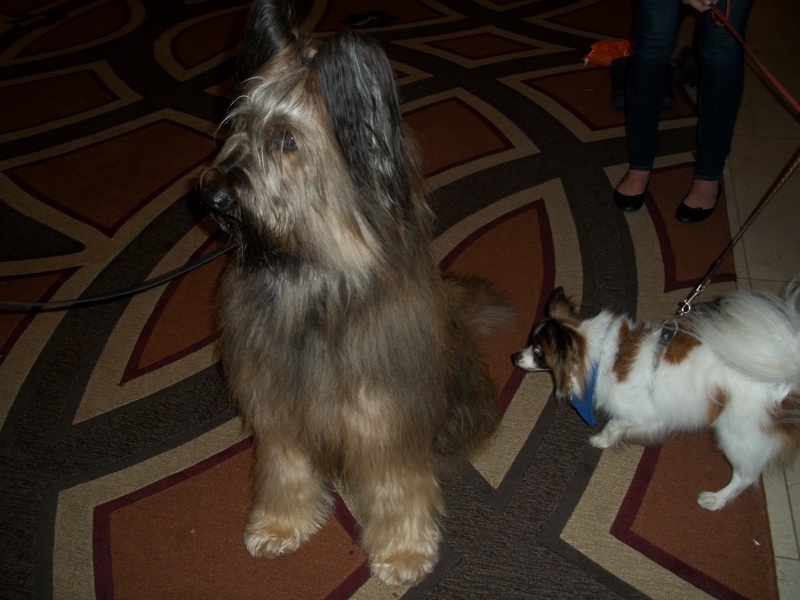 This entry was posted in Uncategorized and tagged Ask Fisher, BlogPaws 2013, Norman the Scooter Dog, PetSafe, Pixel Blue Eyes. Bookmark the permalink. I’m glad to hear that you had such a great time. My mommy is super, super jealous, but she’ll get over it. 😉 We cannot wait to hear all about what you’ve learned! There were some goldens there, but none as lovely as you! Had I not been so whupped (the drive home was awful, hotel bed) I would have replied, “none as lovely as thee, Miss Harper Lee.” Seriously, I’m getting to where I only can sleep in my own kennel!